As part of the process leading to her canonization, two cases of miraculous healings were presented for consideration. The first one was the healing of Maureen Digan of Massachusetts. 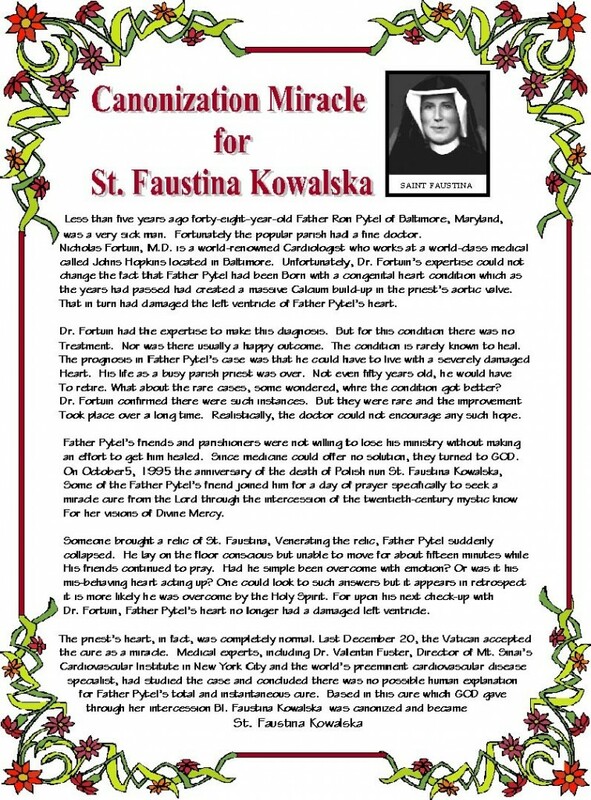 The second miracle was the healing of a congenital heart condition of Fr. Pytel after prayers done by members of his parish during the anniversary of Sr. Faustina’s death on October 5 1995. On April 18, 1993 the Feast of Divine Mercy Sunday (the first Sunday after Easter), Pope John Paul II elevated Sister Faustina to the status of Blessed during the Beatification of this Venerable Servant of God, a day when St. Peter’s Square was packed with enthusiastic Divine Mercy devotees.